For some time now the Bulgarian prison guards have been grumbling about their wages. Of course like everyone they claim that they are underpaid and overworked. Mostly they base this claim on the lie that their job is somehow worse or more dangerous than any other job. However if you looked at the facts it is clear that guards not only shouldn’t have a pay rise, but that actually they are being paid too much at the expense of the tax payer. In Bulgaria the guards work 24-hour shifts and then have 3 days off. At first glance a 24-hour work shift appears to be a bad deal for the guards. But don’t let the appearance fool you. The guards are not actually working for the entirety of the 24 hour work period and in fact they have scheduled sleep. Yes, that’s right, folks, prison guards in Bulgaria are paid to sleep. By law all cells in Bulgaria are closed between 20:30 pm and 06:30 am. That means automatically 10 hours of the 24 hour shift the guards are sleeping both legally and illegally. Furthermore prisoners only have activities around the prison during normal work hour so the bulk of the work for guards is between 9am and 5pm, before and after these hours the majority of prisoners are locked in their wings. If guards only work every 4th day, that means they are working only 8 days a month! But that’s if you ignore the fact that they are sleeping for the majority of these “days”, in reality guards WORK about 5 days a month. Why do guards only work 8 days a month? The shortest explanation for why guards work 8 days a month is because they want to. Working 8 days a month allows them time to work illegal second jobs. These illegal second jobs are undeclared and so they are not paying tax. Also of great concern is the amount of guards whose second jobs are working for prisoners, for example many guards drive taxis owned by prisoners. What has Europe said about the issue? Currently the guards are complaining that they are working too many hours; there are even cases where guards have sued the tax payer because they were not paid their “overtime” which consisted of said guards sleeping. The truth is that the 24-hours system must be finished and guards should be working less hours per shift. The time when prisoners were under military type laws is well and truly over and there is simply no need to continue the practice of 24-hour work shifts, the prisoners aren’t happy with it and the guards are protesting it as this is being written. There is a myth that is perpetuated by the media, tabloid press and the prison staff themselves that prisons are places of violence. They are, but what you are not told is that the majority of violence is either ‘prisoner on prisoner’ or ‘guard on prisoner’. ‘Prisoner on guard’ violence is almost unheard of in Bulgarian prisons. 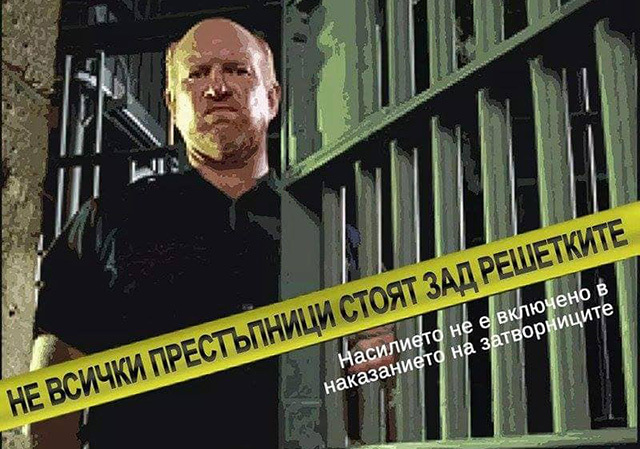 Sofia Prison is Bulgaria’s largest in terms of population and in 10 years, one guard was stabbed by a mentally ill prisoner, but it was the prisoners themselves who rescued the guard and pacified the mentally ill prisoner. All the guard did was run away and leave a knife wielding mentally ill man in a locked room full of prisoners. Otherwise the overwhelming majority of guard related violence is the guards beating and torturing prisoners they don’t like. That is why in the last few years Bulgaria was forced to install cameras in holding cells where guards used to torture prisoners. When prisoners are tortured they then sue and now not only is the tax payer paying for a guard to work 8 days a month, but now they have to pay for the court and compensation when the prisoner sues the state for violating his/her human rights. Guards only need high school education and there is no other training or requirements. They claim there is a physical exam, but if you’ve seen any prison guards recently you’ll realize quickly that guards are not kept to any physical standards. Nor are guards required to learn the laws or about human rights. Yet without any education or special standard already they receive 700 leva wage a month, which, as already mentioned, means 700 leva for about 8 days’ work, the majority of which they are sleeping. Without excluding sleep the guards already get paid 87.50 leva a day and if we exclude sleep they receive around 8 leva an hour which is even higher than some other European Member state wages for non-skilled employment. That is of course ignoring the fact that the 24-hour work shift also allows them to work their second illegal and undeclared work. Guards also get lots of other perks that their counterparts in Europe do not receive, for example free uniforms and transport to and from work, even in the British Army soldiers are required to purchase their own uniforms, yet here the guards still believe they are living under Communism. When it is all laid out it is clear that guards in Bulgaria have a sweet deal and they know it too, which makes their protests all the more arrogant. So why isn’t the state taking action? We sent a request to the Ministry of Justice this year requesting that the 24-hour shifts end, but the Vice Minister of Justice refused to take such actions meaning that the state is not only in breach of Council of Europe – CPT recommendations but also it is a violation of the rights of the guards leaving the state open to even more compensation cases. There are only two explanations for why the Minister of Justice hasn’t taken actions to remedy this problem and the first is: because they are incompetent, which is highly likely as the Vice-Minister of Justice has had absolutely no experience with the penitentiary system before being appointed to the position by VMRO. The second explanation might be that the Ministry has been hijacked by the bureaucrats and the government is too weak to enact European reforms that are unpopular with the prison guards.